Dungeon crawlers have a reputation for being daunting, often unfair experiences. 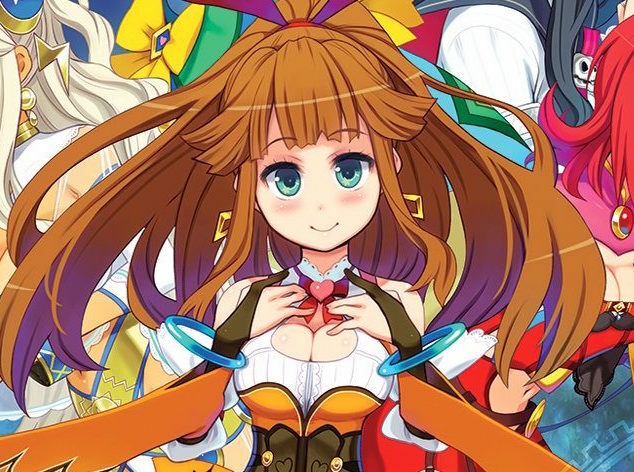 Based on MeiQ's subtitle, you’d expect a game in the same vein as Etrian Odyssey; a punishing but rewarding roguelike loaded with thrilling randomness at every turn. In actuality, MeiQ represents one of the cosiest, simplest approaches to a dungeon crawler around. We’re talking predetermined dungeon designs and possibly the lowest enemy encounter rate I’ve witnessed in any game, for starters. A roguelike this is not, but by using a remarkably similar setup and aesthetics, the developers had all the tools to concoct a fresh twist. As those games tend to be heavily influenced by elements beyond the player’s control and emphasise failure, a rare divergence from that formula for one fuelled by skill and legitimate exploration could be compelling if well-executed. By all means, MeiQ’s initial charm weaves the impression that the game is aiming high. The unique character artwork aces its job to the extent that gazing at a character’s default facial expression offers an accurate read of their overall personality. Despite a reliance on established JRPG and anime tropes, the plot hooks players in swiftly by utilising gals with defined personalities and the ensuing banter flows as naturally as spring water. This leaves ample space for them to evolve over the course of a 20+ hour epic or for their traits to mean something more. The central protagonist, Estra, is one of five mages destined to wake the world from a state of slumber using a mythical key. Despite being an easygoing lady, she’s tasked with competing against her peers to gather MacGuffins from four sacred towers (or, more accurately, dungeons). To even the odds, each mage is given a hulking mechanical partner that can be used to slay the monsters roaming each tower. It’s a fairly traditional setup, but one with potential for a deconstruction of norms or simply a well-crafted tale. Over time, however, it becomes apparent that what you see is what you get. The characters aren’t disappointing for clinging to tradition but for outright stagnating. While initially inviting, the archetypes are played completely straight over the long haul and the eventual villains are downright starved for depth. The scant number who do learn from their journey do so in hackneyed fashion. Plot twists tend to reek of inevitabilities thanks to overreliance on genre norms and particularly transparent foreshadowing. The more standout elements such as the competition between potential world saviours wind up dropped early on in favour of a classical JRPG setup. Even after a series of endgame plot twists hit, the narrative remains a shallow one that fails to step out from the shadow of past Compile Heart titles. This is the stuff of traditional fantasy through and through. And yet, I have to admit that there’s an X-factor in play that kept me reasonably engaged. It might have actually been the relatively shallow character interactions, simply because the characters play off each other’s responses so well. Despite the otaku-oriented characters designs, the game’s script is pleasantly tame where humour and many other aspects are concerned (making it truly baffling that the game was refused classification in Australia). Most likely, however, it was the clever integration of world’s lore into the dungeons themselves. Scattered amongst the ancient rubble, players will find tomes containing mankind’s war torn history that reveal how the world ended up in such a sorry state that time itself had to be paused. Similarly, the stumbling upon the scattered pages of an adventurer’s journal makes dungeons feel like more than regions that exists so we can have a game to play. The eventually payoff isn’t what I hoped, but I have to admit that being strung along offered more excitement than the immediate plot before me and even managed to flesh out the main villain just a tad. Despite the shortcomings, MeiQ features a manner of storytelling I’d like to see executed elsewhere because the end result exceeds the sum of its parts. 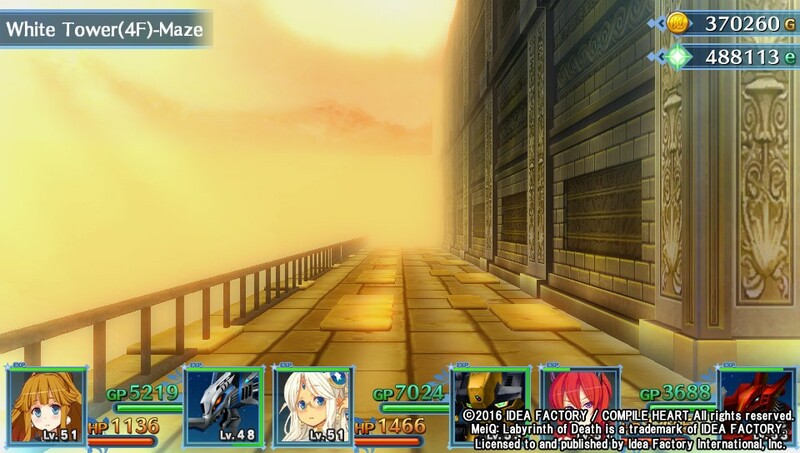 The bulk of the game is spent not wandering through towns or reading dialogue but investigating the titular labyrinths from a first-person perspective. Each dungeon features about five to ten floors, which sounds insignificant by some 'crawler standards, but each of these is actually so dense that a full screen map can’t convey the space on a single floor. As mentioned earlier, these are not randomly generated areas but predetermined ones. It’s disappointing, then, that dungeons are so similar and are starved for engaging obstacles. The most you're likely to get is a warp panel maze or a locked door that requires a switch, certainly nothing that can be called a puzzle. The result is an experience teeming with potential but, by the time the credits roll, almost never broadens beyond what was originally presented. Despite the lack of threats, the game lavishes players with safety equipment and rubber walls. The player is virtually unpunished by death and checkpoints are also hidden on most floors. The game even supports suspend saves, so you can regain your progress in a jiffy no matter what happens. Battles are few and far between due to the encounter rate, which makes the experience of searching through a massive dungeon a little more gratifying since it isn’t constantly interrupted. The game hits peak frustration when it forces the player on wild goose chases for items hidden in previous towers to progress the current objective; ones that can’t be acquired until the game tells you so. Once or twice would be no skin off the player’s back, but by the umpteenth time it's all too easy to forget the current goal because of the blatantly contrived reasoning. These backtracking segments serve no narrative purpose and function as detrimental padding on a game that could have been pleasantly succinct. I will say that the turn-based combat system is a serious highlight. Fights use a variation of the rock-paper-scissors-Spock-lizard matchup game to reward players for employing sufficient type diversity into their party. Parties are a nifty mixture of mages with fully customisable mechas called Guardians. A mage must be paired up with a guardian in order for it to function and the pair is given one combined turn. The mechanical beasts cannot heal, revive, or buff party members like their human counterparts can, but they can dish out truly astronomical damage thanks to a clever bonus system. Depending on how you outfit your mechs with stat boosters and equipment, they’ll receive percentage-based boosts to some otherwise run of the mill stats. 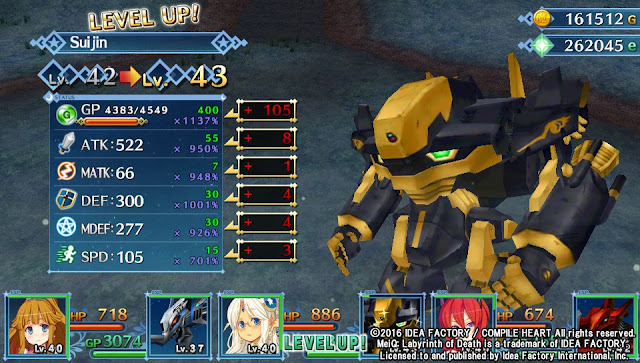 Pair the right characters and mechs with an optimal equipment set and you can multiply your base power by 1000 per cent or even higher. As the plot develops, protagonist Estra acquires new outfits that allow her to complement elemental guardians that would otherwise be opposed to her, affording the player new opportunities to experiment with nearly a dozen other mechs. You even get to craft new weapons and evolve existing parts, although dungeon materials tend to suffice. This is an overall sophisticated system that, in theory, presents appeal to both newcomers and veterans. 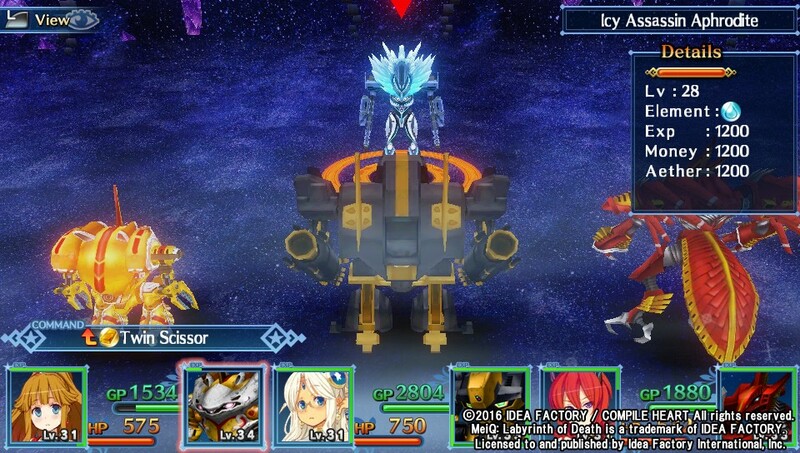 It’s just disappointing that the battle system never attains its full potential, no matter how snazzy the animations and Guardian designs look. Repeatedly mashing the same attacks after you’ve achieved a half-decent setup will get you far, even if you completely ignore the strengths and weaknesses of elements in relation to each other. Until you unlock the third tier of difficulty, there’s little demand for intelligence outside of a few boss fights (and even there the game demands grinding more than anything else). 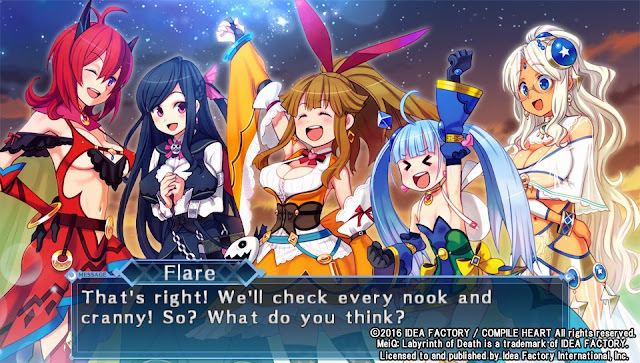 Related reading: For people looking for serious fanservice, Moe Chronicle, also by Compile Heart, is the dungeon crawler for you.